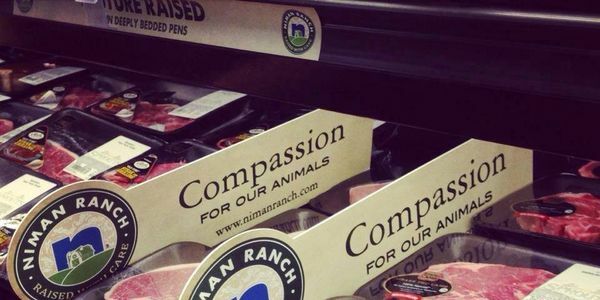 petition: Whole Foods: Please place "Compassion for Animals" Signage by the vegan products, NOT the meat! Whole Foods: Please place "Compassion for Animals" Signage by the vegan products, NOT the meat! There is one rather glaring problem. Allowing this signage in the meat/dairy/egg product areas but not having Compassionate/humane indicating signage by vegan products makes absolutely no sense. Vegan products do not kill animals and tend to have stronger overall ethics in other areas as well... but slaughtering animals (which is the end process of all of the milk, meat and egg businesses, big or small, factory or family) is not a compassionate act - yet the signs calling attention to these ethics are everywhere in the animal product areas of WF. WF has lots and lots and lots of vegan and vegetable products on their shelves and in the refrigerated and fresh sections (and personal care sections) that do no involve the killing of animals at all - - but there is no visible signage or marker allotted by Whole Foods that educates and promotes that these foods are, in fact, humane and compassionate to the highest degree possible and that vegan companies are striving for the highest compassionate and humane ethics of anyone. WF is a company whose mission is to educate and we hope they will listen and at the very least be fair and balanced in how they let vegan companies promote their goods. Thank you for signing and helping us get a little more truth-in-advertising at WF! **The majority of farm animals are slaughtered as early as a few weeks up til 2 or 3 years on average. Most baby calves and pigs are slaughtered by 6 months; "broiler chickens" are on average slaughtered at only over one month old. Animals like cows and chickens kept alive for milk or egg production are slaughtered within 2 to 4 years. There is one rather glaring problem. When we go into Whole Foods to shop, the ONLY products being marketed with signage as "compassionate" and "humane" are - - ironically - - the meat, dairy and egg products - products of industries that slaughter billions of animals. Baby animals, no less. Sad and shocking but true. Allowing this signage in the meat/dairy/egg product areas but not having Compassionate/humane indicating signage by veg products makes absolutely no sense. Vegan products do not kill animals and tend to have stronger overall ethics in other areas as well... but slaughtering animals (which is the end process of all of the milk, meat and egg businesses, big or small, factory or family) is not a compassionate act - yet the signs calling attention to these ethics are everywhere in the animal product areas of WF. WF has lots and lots and lots of vegan and vegetable products on their shelves and in the refrigerated and fresh sections (and personal care sections) that do no involve the killing of animals at all - - but there is no visible signage or marker allotted by Whole Foods that educates and promotes that these products are, in fact, humane and compassionate to the highest degree possible and that vegan companies are striving for the highest compassionate and humane ethics of anyone. We want to kindly ask that Whole Foods remove the "compassionate" and "humane" signage that is wrongly placed by the slaughtered-animal products, and instead, place those signs in the store areas that truly ARE devoted to compassionate and humane ethics: with the products that are vegan and do not involve slaughter. We would also like WF to encourage the vegan companies to create comparable visible signage about their humane ethics and agree to display that signage (since they were willing to do that for the meat/dairy/egg companies and display it so prominently.) WF is a company whose mission is to educate and we hope you will listen and let vegan companies fairly promote their ethics.